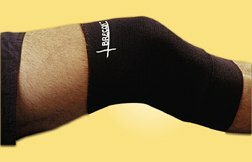 No-Wrap tubular compression bandage is an effective , multi-purpose bandage for the prevention and treatment of sprains, strains, and "soft-tissue" injuries. It's specially designed to promote the healing and rehabilition process by reducing swelling and preventing the accumulation of excess fluids in the tissue which causes stiffness and pain, resulting in a slower recovery. No-Wrap offers constant uniform pressure over varying body contours without restricting motion. 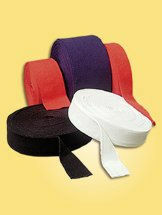 Application is quick and easy and patients can re-apply bandages as effectively as a professional. No-Wrap is made from soft ring-spun yarn for comfort and inlaid every other row with wrapped rubber for firm support. It's available in multiple widths and in four wash-fast colors: black, white, scarlet and navy. All our No-Wrap products are made out of the highest grade, hospital tested, materials to ensure uniform elasticity and durability. In fact, we're so confident about the performance of our products that they all come with a full one year warranty. 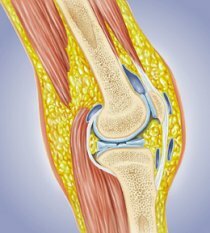 SWOLLEN KNEE That means that if for any reason one of our products doesn't measure up, we want to hear about it. We'll happily replace the item or refund your money, no questions asked. No-Wrap products are used to prevent grass and turf burns. No-Wrap is used to expedite the return of fluid from extremities and can be applied in tapered layers using varying widths. 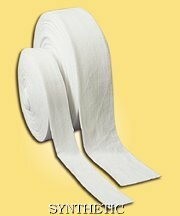 No-Wrap is used to secure hot and cold packs quickly and easily over injured areas. 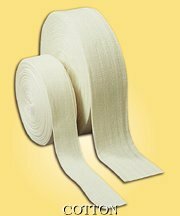 No-Wrap is used as a pressure dressing to hold gauze and bandages in place, eliminating the need for tapes and adhesives and makes bandage changing a snap. No-Wrap provides the compressive support and warmth needed for groin, thigh, hamstring, and calf injuries. No-Wrap is used as protection under braces to prevent excessive pressure and irritation. Knit padding is not as rigid as foam and conforms better to the elbows and knees. Unlike foam, knit padding will not break down after repeated washings. Knit padding will not wear thin after repeated use. It actually bulks up after washing. No-Wrap A / L Pads are excellent at preventing grass and turf burns by protecting elbows, knees, shins and forearms from abrasive surfaces. It is a proven effective deterent to grass and turf burns. It minimizes the re-injury of scab wounds. It reduces the exposure of an open wound to potential infection. Don't let cuts and abrasions be the cause of lost game time. Protect your athletes critical contact points and reduce the effect of the "Blood Rule" on your team. No-Wrap Turf Pads are made out of tough tubular compression and feature a polyester-lined open-cell foam pad. Available in two sizes (Medium and Large), and come in four wash-fast colors: black, white, scarlet, and navy. A favorite of the skill positions because of its light-weight, low bulk and clean tight fit. No-Wrap A / L Shell is a tough compression shell for arm and leg protection. It is an excellent and economical way to prevent grass and turf burns. Unique tapered cuff construction aids in controlling the position of the Shell during contact. Two layer design provides support. Available in multiple sizes and four wash-fast colors: black, white, scarlet, and navy. 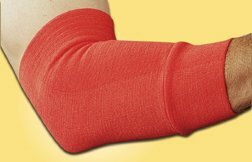 Our A / L sleeve is a one ply compression sleeve designed to keep pitchers' and quarterbacks' arms loose and warmed-up without a lot of bulk and without restricting motion. 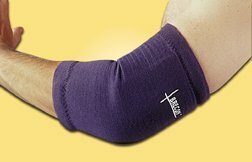 A / L sleeve aid in expediting the return of excess fluids and promote the healing and rehabilitation process. Available in multiple sizes and four wash-fast colors: black, white, scarlet and navy. 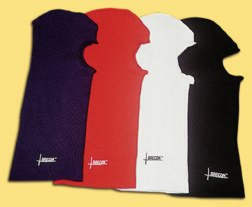 No-Wrap tubular athletic hoods are uniquely to minimize heat loss from the neck up. Our full length contoured design fits snugly without impeding sound. The double stitched seams minimize bulk for comfort under helmets and caps. 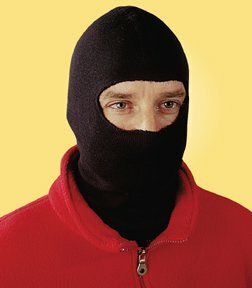 Comes in four wash-fast colors: black, white, scarlet, and navy. One size fits all. Perfect for cold weather activities for the athlete and spectator alike. 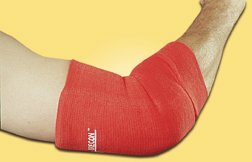 Our No-Wrap Ice Sleeves are specially designed to reduce and control swelling by applying ice and pressure directly where it's needed. Two side pockets hold ice firmly in place to eliminate the need for tapes or bandages. The inner layer provides a comfortable squeeze to reduce swelling while separating skin from ice. Application is quick and easy. Ideal for treatment on the field or in the therapy room. Our No-Wrap Stockinet is made from soft ring-spun yarn that stretches easily and conforms readily to arms and legs. Ideal for all casting applications. Each 25 yard roll is packaged in a travel-ready dispenser box so you can use only what you need eliminating unnecessary waste. No-Wrap tubular synthetic stockinet is designed for use with synthetic casting systems. It has superior wicking action and fast drying features. 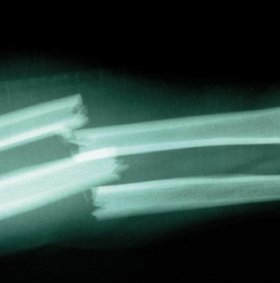 To date, the few studies that have been done indicate that the majority of blood injuries are a result of abrasions to the elbows, forearms, shins, and knees. Before the threat of HBV and HIV contamination became prevalent, these abrasions were generally cleaned and dressed without any notoriety. Now, every skin puncture is considered a major incident and must be treated accordingly. Resulting in delayed games while surfaces are disinfected and players are treated, plus the necessary paperwork filings and subsequent testing for the affected players. It's much simpler (and less expensive) to just prevent the injury in the first place. The very best product I've used for the protection of these most vulnerable areas is No-Wrap . Both in my clinic and out on the field, players have reported to me how durable and comfortable the No-Wrap pads, sleeves, and shells are. Without exception, players are seeing significantly fewer abrasions. 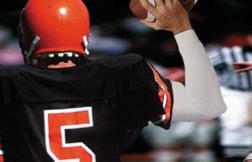 No-Wrap is already used by many college and pro teams around the country. If you're not already using No-Wrap , I urge you to try it and measure the difference for yourself. I am confident you'll have fewer injuries and your players will find No-Wrap to be the most comfortable product they've ever used. Plus No-Wrap is machine washable and the inner pads are made from knitted fiber instead of foam so they wear 2 to 3 times longer than traditional padding products. And they carry a lifetime guarantee should they ever fail to live up to your expectations. I know we have a long way to go before we have a permanent solution to the blood contamination question, but in the meantime No-Wrap goes a long way toward answering the question of - HOW TO PREVENT IT? In an industry where endorsements are a dime a dozen, I want you to know that No-Wrap is the first product that I have felt confident about putting my name on. © 2019 Brecon Knitting Mill, Inc.